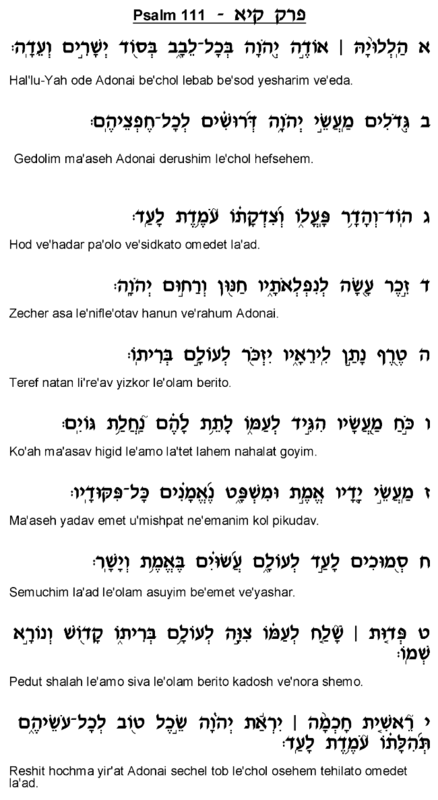 Psalm 111 is the first chapter in Tehillim written alphabetically, as each consecutive half-verse begins with the subsequent letter of the alphabet (excluding the introductory exclamation of "Halleluya"). In verse 1, "Odeh" begins with an "Aleph" and then "Be'sod" begins with the letter "Bet." 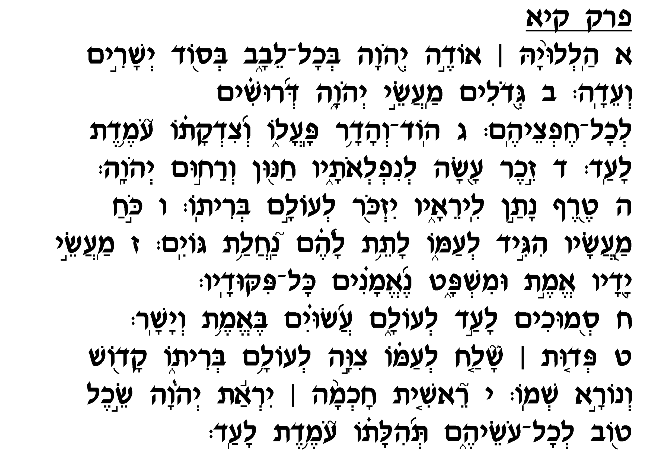 Verse 2 then begins with "Gimal" ("Gedolim Ma'aseh Hashem…") and the second half of that verse begins with "Dalet" ("Derushim Le'chol Hefesehem"), and so on. 4) The profundity and wisdom of the Torah God has taught us. The natural conclusion of contemplating these qualities of the Almighty is the famous declaration made in this chapter's final verse: "Reshit Hochma Yir'at Hashem." The most basic and most important intellectual achievement to which we should aspire is "Yir'at Hashem," fear of God, an awareness of God's authority and a firm commitment to obey His laws. The more a person contemplates the greatness of the Almighty, the more he will come to realize that serving Him must take precedence over any other pursuit, and should be the most important goal that one strives to achieve.